Ditch that packet of brown sugar glaze that came with your spiral ham, and make this super easy 2-ingredient glaze instead! I don’t think you’ll have any leftover ham, but just in case I’m also sharing 9 most delicious leftover ham recipes for you! Just look at that beautiful glaze! 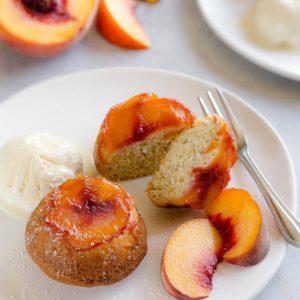 It’s no boring brown sugar glaze. And no, not honey pineapple glaze either! 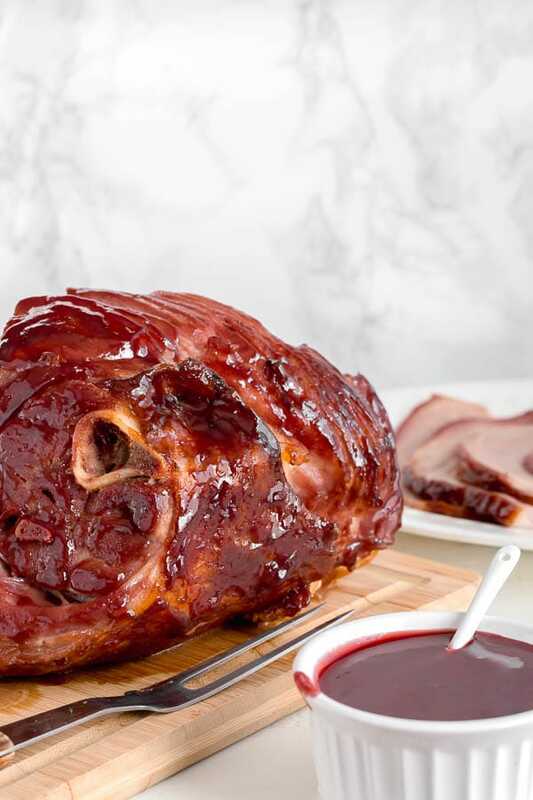 This year, let’s try something different, like amazing raspberry mustard glaze! 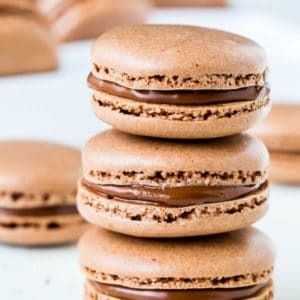 It’s not only delicious, but it’s SOOOO easy! 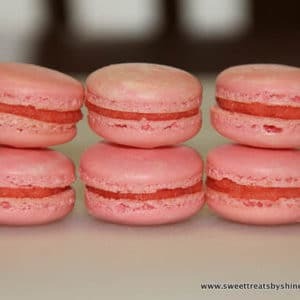 Just mix 2 ingredients, and VOILA! 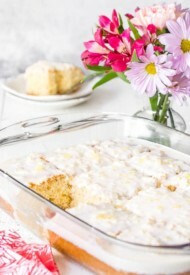 Not overly sweet, a little bit tangy, perfectly sticky and beautiful! So, before we get into nitty-gritty of the spiral cut ham recipe, let’s discuss how to choose the best ham to serve for holidays. City hams – This’s the most common form of ham sold in the U.S. It’s wet-brined ham that’s usually sold fully-cooked. 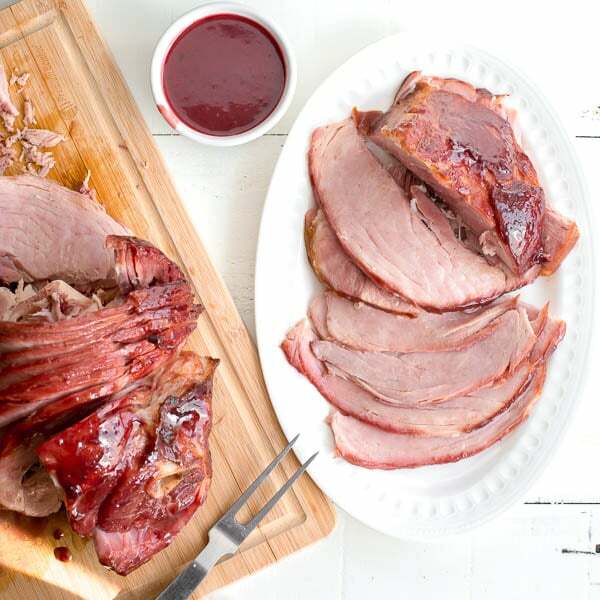 Spiral cut ham is precooked city ham, and it’s the easiest to prepare. Country hams – This’s dry-cured ham, that’s sold mostly raw. Due to the nature of curing (packed in salt), this type of ham is drier and has much more intense flavor. Fresh hams – This’s basically a raw pig’s leg. So in conclusion, bone-in spiral cut ham with a label “ham with natural juices” or “ham, water added” is the best ham to buy for holidays. Now, how much ham to buy to feed a crowd? Typically, you want to plan for ½-¾lb per person, assuming you have a bone-in ham. Ok, let’s talk about the recipe now. 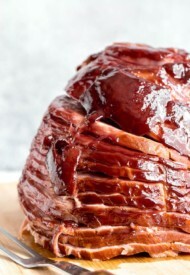 How to cook a spiral cut ham? Well, it’s easy. Earlier I mentioned, spiral cut ham is precooked ham. So you don’t need to actually cook it again. By roasting it in the oven, we’re basically reheating it and applying some delicious glaze. And to prevent moisture loss during reheating, we’ll wrap the whole thing in a foil and roast low and slow. (In the video below, I’ll show you how to wrap your ham so that it’ll be easy to unwrap later on.) To finish it off, we’ll open the foil and roast further with a glaze! 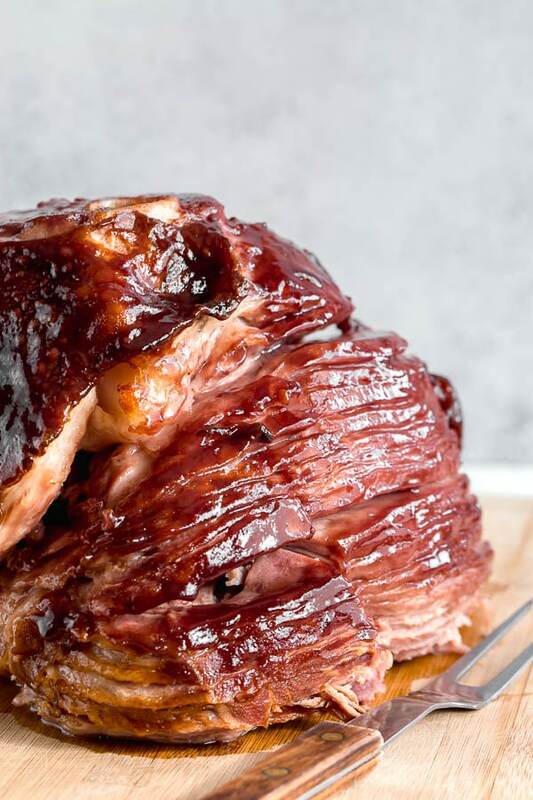 This low and slow roasting (reheating) method is guaranteed to serve you a beautiful moist ham. You’ll actually see a pool of ham juices in the bottom of the foil packet. It keeps your ham moist, while steaming during roasting. Oh and save all that juice for another use, like ham and potato soup! Scroll down past the recipe for 9 delicious leftover ham recipes. 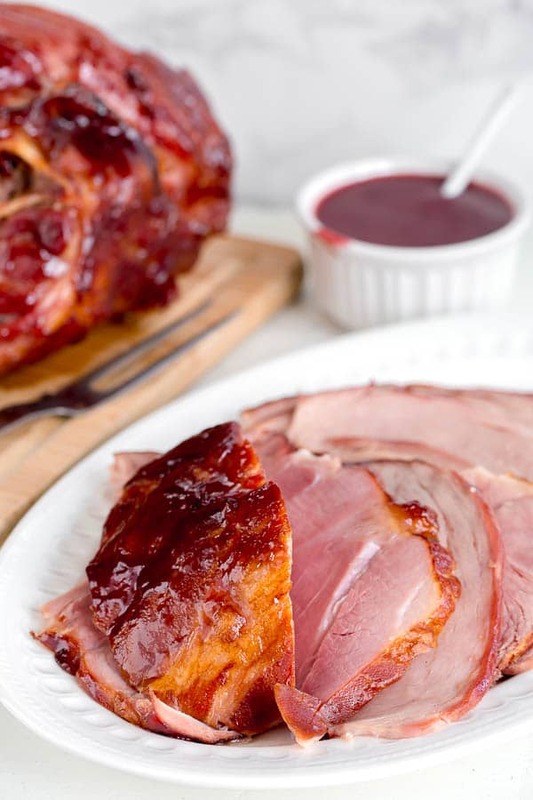 How to cook the best moist ham with raspberry mustard glaze. Layer 2 long sheets of aluminum foil on a baking sheet, as shown in the video above. Place the ham cut side down. Wrap the ham by bring all 4 ends of the foil up and around the ham. 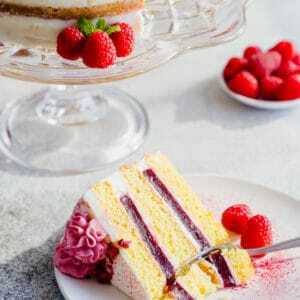 Meanwhile, in a medium bowl, whisk together raspberry jelly and mustard until smooth. Reserve about 1 cup of glaze for serving. Remove the ham from oven and carefully open the wrap. 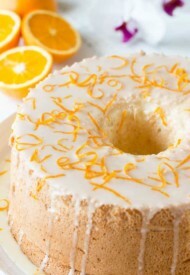 You’ll get a pool of juices in the bottom. You can baste it over the ham, if desired. Increase the oven to 375°F. 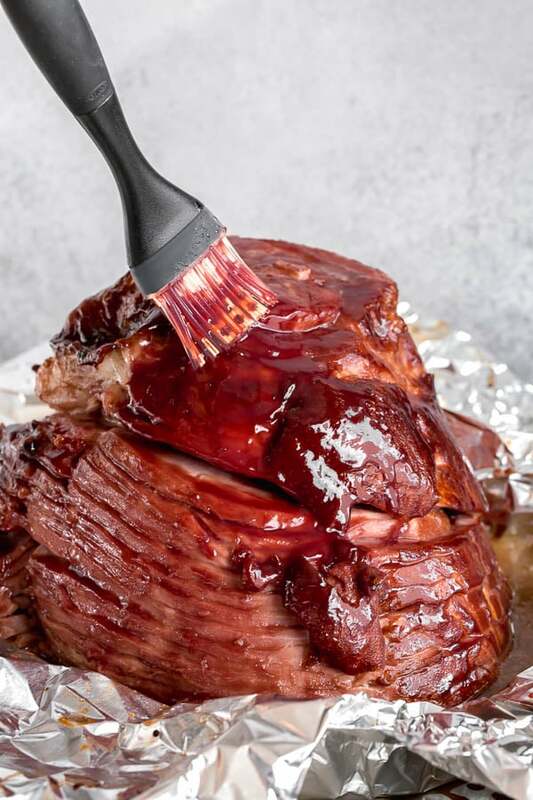 Brush on the remaining glaze all over the ham. 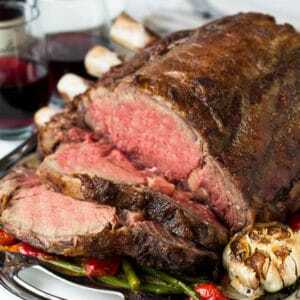 Roast without cover for 30 minutes, basting every 10 minutes. 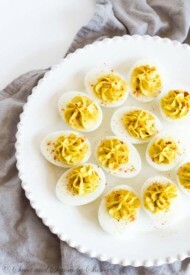 Serve with the reserved raspberry mustard glaze on the side. Yes, it is. Thanks, Carolyn!